Is it possible that Michael Jackson’s Thriller is underrated? No, don’t consult your dictionary, I mean underrated in the way you think I mean underrated. Yes, it’s an album that sold more than 40 million copies worldwide, the best-selling recording ever. And for that very, very good reason, it’s well known as a business and marketing success. 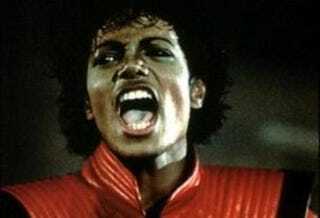 Thriller revived a sagging music industry that couldn’t market disco and failed to understand punk rock. The videos for Jackson’s songs, especially “Beat It” and “Thriller,” established music video as viable art form instead of a long-form commercial. In addition, Jackson’s success was a crossover behemoth. He drew from all genres and made music that moved him without regard to the racial barriers imposed by the music industry. That’s all well and good, but for me the real impact of Thriller is the music. It was daring and inventive and—incredibly—all of its gambles paid off. I think that all the focus on the business and sociological elements of Jackson’s success obscures the magnificent artistic achievements on the album. The stellar moments start on the first track. The percussive rumble that launches “Wanna Be Startin’ Something,” is a pure hip-hop inspired breakbeat, which was visionary for 1982, but the best part of the song is Jackson’s singing. He shadowboxes these beats, countering them at times with long notes and jabbing at times with stuttering growls. I don’t know if Mary J. Blige was inspired by this track, but there’s a very clear link between it and her early work. “Baby Be Mine” offers another daring fusion, as the horn sounds of Memphis R&B with the dry synthesizer fills what would become the calling card of mid ‘80s pop. The song blends them as if it were a natural progression. The title track starts with an overture. This wasn’t that unusual in the pop that Jackson grew up on in the early ’70s, but it was completely anachronistic by the early ‘80s as songs became tighter and shorter. Yet, it works perfectly in setting the tone for the extended drama. Many vampire movies owe their existence to this song and its video. The hand claps on “Thriller” and “Beat It” influenced the most recent TV on the Radio disc, Dear Science, and Eddie Van Halen’s snarling guitar of “Beat It” revived the glorious sound of funk and rock together in a way that hadn’t been heard since Labelle disbanded in 1976. “Billie Jean” is another one of the all-time great vocal performances on this recording. Just think about the hiccup of wistful regret that launches the line “She told me her name was Billie Jean/as she caused a scene.” The hiccup comes back at regular intervals growing into a melancholy lament, yet—as we all remember—“the kid is not my son.” Jackson’s vocal technique creates an additional narrative element to the song. Another remarkable aspect of that song is that it is written in a minor key. Minor key songs are lighter and darker and rarely make the top 10. “Human Nature” is also a vocal tour de force, with Jackson’s wispy croon gracefully phrasing behind the beat. It’s sung with technique that many a jazz vocalist might admire; it’s little wonder that Miles Davis covered it in 1985. The hard-charging “P.Y.T.” (Pretty Young Thing) features more vocal gambits, along with ad libs. Seven of the nine tracks on this 42-minute masterpiece were top-10 hits (only “Baby Be Mine” and “The Lady in My Life” missed the top echelon of the charts). The soaring finish of his early hit “I’ll Be There” notwithstanding, Jackson didn’t possess a voice that could take a vowel and fill a football stadium with it. Instead, he used his voice to contrast and accent unique rhythms, and Thriller is full of these innovations. The music on Thriller was forward-looking and the performances are riveting. Twenty-seven years later, it still sounds new and exciting. Thriller would be the pop masterpiece of the past 40 years if it had sold one-tenth of the units it moved, but fortunately it was music that millions got to hear. Read more King of Pop coverage on Newsweek.com .